I have put together a few looks for you for a little inspiration if you are still unsure what to wear. They are three completely different looks, so is perfect for whatever your antics are; whether you are going for a meal, drinks or out with the girls. 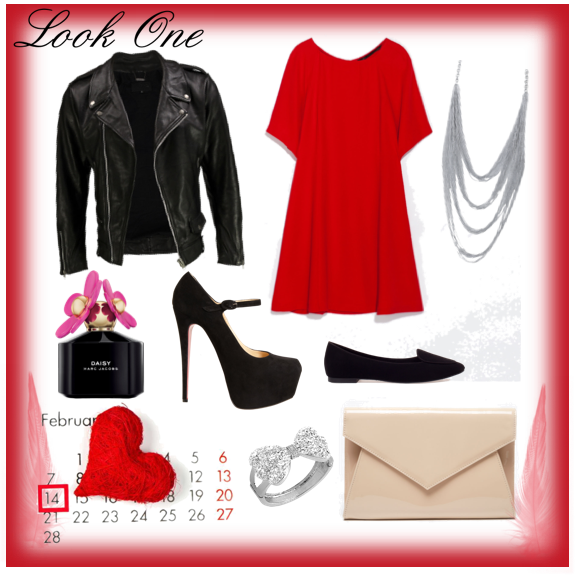 The floaty red dress is super girly, you can team it with either flats or heels, and a leather jacket if you want to add some warmth. If it is very cold where you are then a fur jacket could make it very cosy. If you want a more casual look then stick to wearing leggings or trousers there is really nothing wrong with this, if you want to add a bit of edge then pick a leather pair, teaming it with a smart blouse and some wedges. The third look is definitely for a night out with the girls, this skirt is a very popular trend this season amongst shops, the luxe leather makes it look more quirkier, alongside a cute girly blouse or shirt and a pop of colour for the heels. For your make up I would say less is more, a beautiful feline flick eyeliner with pristine brows and a hint of colour on the cheeks with bright red lipstick definitely spells out Valentines! If your more of a smokey eye girl use pretty colours such as pinks and purples.